Since last year the village has been replacing coal-burning household stoves with a new village district heating system. 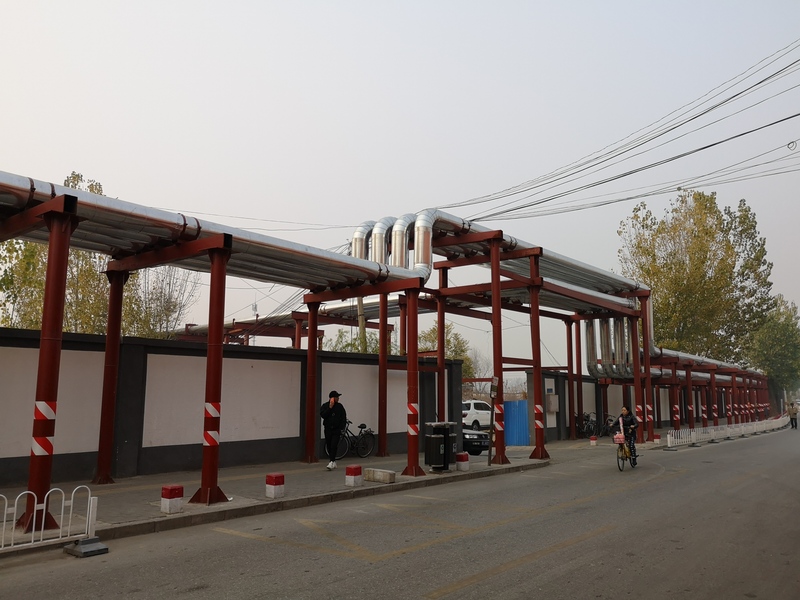 Pipes, half a metre in diameter, have been installed above ground to bring hot water from an electric heat plant several kilometres away in Xibeiwang. “It’s a lot less hassle this year,” sighs Li, “we don’t need to buy coal and keep the stove going”. The “heating season” in northern China refers to a period each year when centralised district heating systems are switched on to provide heat to local homes. But the bulk of residential and industrial energy needs have long been met by coal, so the season is also marked by a spike in air pollution. In Beijing, from 2010 to 2014, PM2.5 levels went up over 50% during the season. The government launched a war on smog in 2013 to reduce pollution in key cities and regions by the end of 2017, including in Beijing. As the deadline approached, northern China experienced the biggest ever campaign to replace coal with natural gas. In Beijing alone, 140,000 households across 336 villages bid farewell to coal. The toughest ever restrictions on industry were also put in place – from mid-November to mid-March 15 key cities including Shijiazhuang, Tangshan, Handan and Anyang had to cut steel manufacturing output by 50%, and aluminium production by 30%. The ambitious targets set five years earlier were easily met. PM2.5 levels fell 39.6% in the Beijing-Tianjin-Hebei area; 34.3% in the Yangtze delta; and 27.7% in the Pearl River delta. But the rushed measures caused serious problems. The removal of coal heating increased demand for gas, which led to shortages and inadequate heating for many households. The restrictions on industry left some firms struggling to survive. There wasn’t enough time to install the gas pipes underground in Shijing, so they were left above ground – another safety risk. There were also widespread reports last winter of heating problems caused by failures to complete the switch to gas on schedule. Some schools in rural Shaanxi had no heating as the coal-fired boilers had been removed before natural gas pipes were installed. Linfen, in Shanxi, had a 155 square kilometre “no coal zone” where residents had to remove coal stoves and weren’t even allowed to keep coal at home – yet no alternative heating was provided, despite sub-zero temperatures. Li Aiying’s village of Hanjiachuan lacked heat for the last three weeks of the heating season. Keen to avoid a repeat of last year, the Ministry of Ecology and Environment published a plan in September to tackle air pollution during the coming heating season. It stressed that new gas or electric heating systems should be in place before the removal of coal ones. There would be no target for the number of households to switch – local governments only needed to report the actual number of conversions. The State Council also published a three-year cleaner skies plan in July 2018 that said households in northern China would have safe access to heating. This winter, heating will not be sacrificed for the sake of cleaner air. Plans to eliminate the inefficient coal stoves can be traced back to July 2016 when the Chinese Academy of Engineering assessed efforts to address air pollution. The report singled out domestic coal burning for its huge contribution to winter air pollution in the Beijing-Tianjin-Hebei region. When choosing a replacement for coal, most local governments opted for gas over electricity because it was cheaper. Opting for electricity would have also placed a strain on the power grid. But the widespread switch to gas increased demand, leading to severe shortages last winter. The switch is continuing this year, and the huge supply gap means that prices have gone up. In May the National Development and Reform Commission announced increases of 20% in the cost of gas for domestic use would be permitted. An official explained that households were buying gas at below the cost of supply. The announcement led to immediate price increases. Zheng Xinye, deputy head of the School of Economics at Renmin University and a professor of energy economics, said that the rise in energy prices and market reforms could hurt low-income households. Most areas of northern China already provide subsidies or higher welfare payments to such households affected by the coal phase-out. But the willingness and capacity of local governments to do this differs. In Xibeiwang, Beijing, the subsidy can be as much as 360 yuan per household per square metre. Li Aiying says that meant heating last year wasn’t any more expensive than it was when they burned coal. A successful coal-to-gas switch relies on an adequate supply of gas and infrastructure to transport it. China depends on imports for as much as 39% of its natural gas supply, and in recent years, demand for gas has outstripped supply increases. The outlook for gas imports is not good. Trade friction between China and the United States has led to tariffs being enforced. Shipping data from Reuters shows that the US sold 130,000 tonnes of liquified natural gas (LNG) to China in July – down on 400,000 tonnes in May. And US LNG imports became even less competitive in August, when China imposed a 25% tariff. Although China is building out its gas network, the surge in liquified natural gas (LNG) imports has contributed to an infrastructure bottleneck. Li Yinghua, deputy head of the National Energy Administration’s oil and gas department, said at a seminar in August that China has only 74,000 kilometres of gas pipelines – 15% that of the United States. The limited pipeline infrastructure means the load on the network is twice that of the US. There is also a shortage of gas storage. China only has enough for 3.2% of annual consumption (gas production plus net imports), and little extra offloading capacity has been added at LNG terminals. According to Li, natural gas shortages will not ease off in the coming years. The restrictions on industry last year also led industry to complain. Plans for this winter, published by the Ministry of Ecology and the Environment, show that restrictions will be more flexible this time round: there are no orders for certain sectors to cut production by set percentages; instead, local governments can look at emissions and reduce manufacturing as and when is necessary. This more targeted approach is definitely an improvement, but it could make tackling air pollution more difficult. Local governments may opt to boost efforts to replace coal with gas or electricity, so they can keep the factories running without worsening air quality. Beijing saw the worst smog of the winter in the middle of November, just after the start of the heating season, with PM2.5 levels of over 300 microgrammes per cubic metre and an amber air pollution alert issued. An editorial on Chinese news site thepaper commented that blue skies shouldn’t just be a temporary good, enjoyed when emergency measures are in effect: “There’s a long way to go to tackle smog, and we must not cease our efforts just because things get a bit better.” The people still want cleaner air, and so the tension between heating provision and air pollution is bound to continue. Back in Hanjiachuan, the village is shrouded in smog. Parents meeting their children at the school gate chat to them through thick pollution masks. Feng Hao is a researcher at chinadialogue, where this article was first published.